Unidirectional valves in CSF shunting were inaugurated by E. Payr in Greifswald in 1907; he implanted autologous saphena veins with preserved flaps as bioprosthetic valves in three ventriculo-sinus-sagittalis shunts (Payr 1908). Artificial CSF valves were proposed by Ingraham in Boston in 1948. The first model – a double ball-in-cone valve with an interposed pumping chamber – had been designed and implanted by F. Nulsen and E. Spitz in three patients in Philadelphia since 1949 (Nulsen and Spitz 1952). Since then, the shunt technology had proceeded continuously, and in the last decades, we saw a wide range of shunt designs. A complete overview of shunting devices is not available. Papers of shunt producers registered 60 models worldwide (Codman 1992). Drake’s The Shunt Book thematized 32 valves (Drake and Sainte-Rose 1995). In 1996, the author reviewed 130 designs and more recently 292 (Aschoff et al. 1996). About 160 are available on the market. For many neurosurgeons, the costs are important. The “Harare shunt” costs $ 3, the Indian Chhabra Slit-in-Spring $ 41, an Integra Cordis Omnishunt € 333, a Cordis-Hakim Standard € 556, and a Codman-Medos Precision Valve € 718. More sophisticated valves, e.g., Orbis-Sigma II costs € 789, Miethke (PaediGAV € 966, Phoenix Diamond € 1286, Medtronic Strata € 1488, Codman-Medos Programmable € 1507, Codman Certas € 1507, Miethke ProGAV with ShuntAssistant and Sprung-Reservoir € 1828, and a ProGAV with an adjustable gravitational ProSA and antibiotic-impregnated Bactiseal catheter € 4040 (prices 2010–2014 in Germany; large differences between countries). Compared to cardiac pacemakers, drug pumps ($ 5000–10,000), or complete hydrocephalus treatments ($ 35,816 Patwardhan and Nanda 2005), the shunt hardware costs are relatively low. In the age of a worldwide patient mobility, it is an increasing problem to identify unknown shunts, to differentiate reservoirs from valves, or to handle adjustable valves correctly. Therefore, it is necessary to get known with the different types of shunt devices, their qualities, and their effectiveness. There are many potential classification criteria which depend on the construction of shunt devices, materials, biocompatibility, the hydraulic function, and the handling of intra- and after operations (Abbott and Sandler 2016). The valve body design (e.g., cylindrical, flat bottom) influences the local biocompatibility only such as risk for skin lesions or suitability for babies. The technical properties are more important. A valve should not be susceptible to external tissue pressure, deforming vectorial forces, etc. The shunt assembly, e.g., one piece versus two or three pieces, determines not the function but is relevant for the intraoperative handling, the risk for disconnections (decreased in one-piece assemblies), and wandering (increased in one-piece shunts). The material: Distal slit valves use one material (silicone) exclusively; others contain multiple plastics (silicone, Dacron, polycarbonate), metals (stainless steel, titanium), or other components (ruby, sapphire, samarium cobalt). The materials determine the mechanical stability, and influence the artifacts in MRI and the risks for allergies and infections, but are not related to the hydraulic functions. The principle of the unidirectional valve (e.g., diaphragm, ball-in-cone, slit) often, but not always, determines the hydraulic function. A comparative valve trial has been based on the assumption: “... all (valves) achieve essentially the same pressure/flow characteristics...” (Drake et al. 1998). Czosnyka’s and our tests did not confirm this hypothesis. A further disadvantage is the different functions of the same constructive element in modified designs. For example, all antisiphon valves contain switching diaphragms; all gravitational valves contain balls. In spite of these elements, which lead in simple DP-valves to high flow and overdrainage (see Fig. 12), the same technical element ball and membrane counteract in the antisiphon and gravitational construction overdrainage using the gravity for upgrading the shunt resistance. Therefore, the valve principle alone has a limited value for the hydraulic function. First of all, it is necessary to keep the ICP within physiological ranges in all body positions, independent of coughing or crying of babies. For an adequate physiological drainage and safety, the following points are most important in order to assess the quality of shunts. The only essential component of a CSF shunt is a catheter. The length ranges from 10 cm in subgaleal to 130 cm in peritoneal shunts. The internal diameter (ID) varies from 0.4 to 1.5 mm (mean 1.1 mm) and the external diameter (ED) from 1.5 to 3 mm. Historical materials were glass wool wicks (Henle 1896), silver wires, tubes made of atex, or formalin-fixed veins (Payr 1908). Actually, more than 95% use medical grade silicone, a few polyurethane or intracranial metal tubes. A shunt consists of normally three resistive elements: proximal catheter, valve, and distal tube. The resistance is additive comparable to electric circuits. A more precise analysis show, that the number of different elements can be higher. Many valve bodies contain two valve units; there are additional antisiphon or gravitational valves, and many shunts have closed distal catheters with lateral slits, which are nothing else than distal slit valves (see Fig. 1). 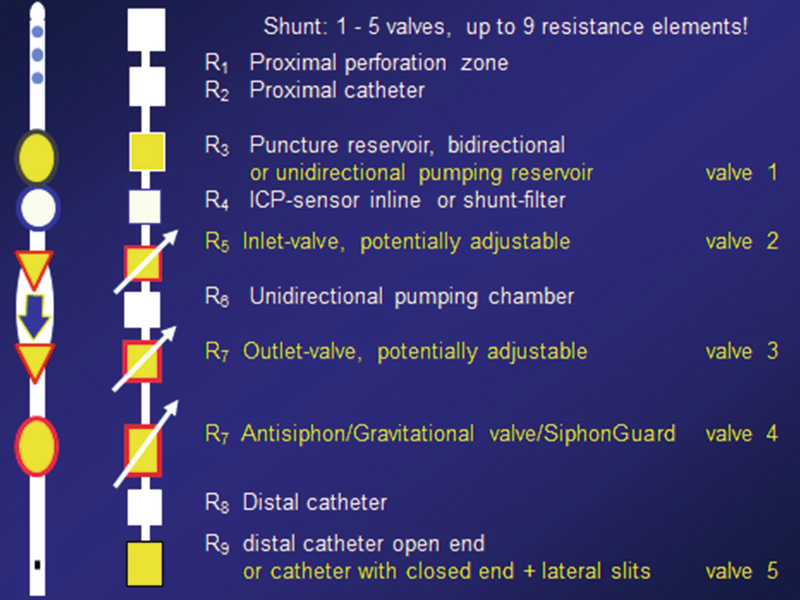 Not only the valves but also the catheters influence the shunt flow particularly depending on the internal radius. The common tubes with ID of 1.3–1.1 mm drain with 30 cm water pressure through 100 cm length 556, respectively, 344 ml/h and support overdrainage (see Fig. 2). There are sometimes confusions around the hydrostatic pressure. In upright position, the effective reference point for pressure differences is not the tip of the abdominal catheter but the subphrenic level; in horizontal the reference is the internal anterior abdominal wall. In adipouse patients, the abdominal pressure can be elevated additionally up to 5 or even 10 mmHg. A massive back pressure of the abdomen can lead to shunt-insufficiencies during pregnancy. The waves of ICP and right atrial pressure are antagonistic as Bering (Bering 1955) showed for the first time. The peak amplitudes of ICP versus right atrial pressure can reach to 5 cm H2O. Ventriculo-pleural shunts have the maximal antagonistic waves due to the intrathoracal negative pressure, which lead to the highest risk of overdrainage and pleural effusions. Biological compatibility: We observed worldwide a range from 0.17% to 27% of infections after shunt operations (Choux et al. 1992; Beez et al. 2014). One problem in this context results from the silicone surface. Since the 1960s, the infection quotes depending on silicone sunk from 11.8% to 5.8% in 24.436 procedures (Aschoff 1995). The use of antibiotic-impregnated catheters decreases the infections for 50% (Bayston et al. 1989). Allergic reactions are extremely seldom. No problems we found in relation to toxicity and oncogenity. Minor problems existed in relation to CSF proteins and medium difficulties in relation to corpuscles (blood). Surprisingly with 500 mg/dl protein, most valves showed – in short term – no significant alteration except of some sticking proximal slit probes and sometimes Orbis-Sigma valves. The trials of Brydon et al. (1996) could be confirmed. Protein effects are usually overestimated. Corpuscles and blood are more by far at risk for valve occlusions (Aschoff 1995). Hydraulic function: Most important is the drainage “on demand.” Normal pressure amounts in a horizontal position to ICP +10 ± 5 cm H2O and in a vertical position about −5 ± 5 cm H2O. In the horizontal position, we have no problems because the head and abdomen are on the same level. In upright position, we have normally a hydrostatic difference of about 30–50 cm between diaphragm and the middle of the head, of course depending on the growth. 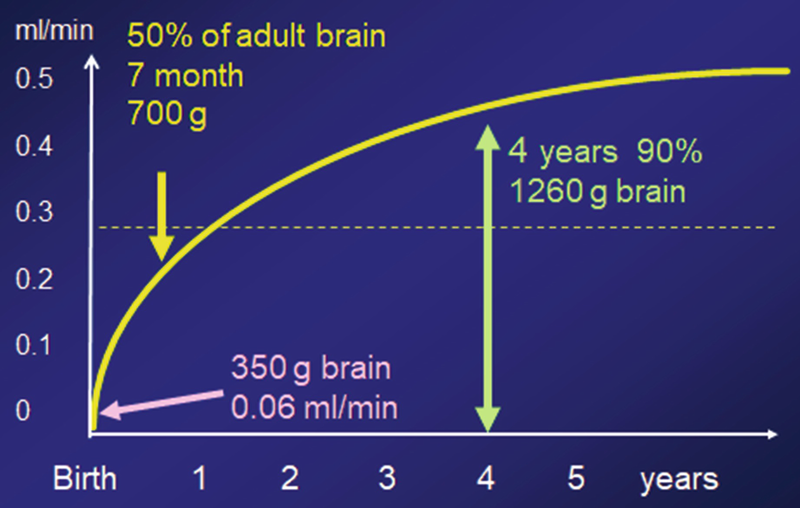 The CSF secretion of a newborn child (brain 350 g) is 4 ml/h, doubles within 7 months (700 g brain) and reaches within 4 years 90% of adult values (see Figs. 3 and 4). For children, a normal pressure is essential in order to achieve a physiological skull shape. Overdrainage leads to slit ventricles (DiRocco 1994). 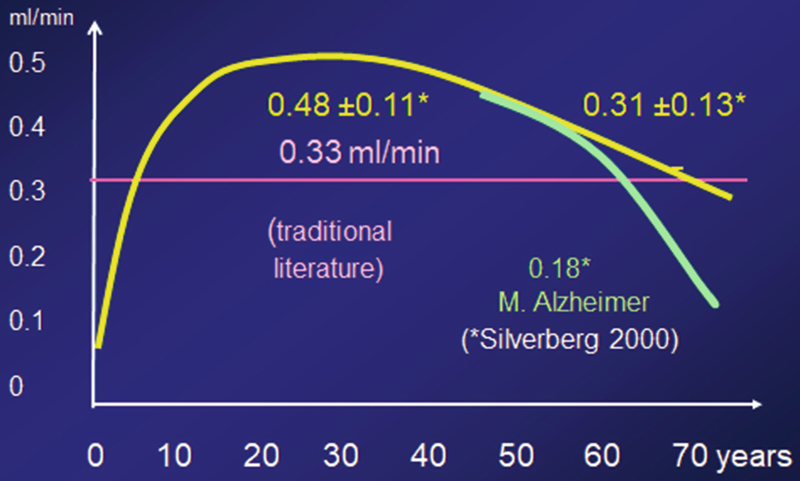 Adults produce between 14 and 21 ml/h CSF in a circadian rhythm (see Figs. 5, 6, and 7). Rare hypersecretory diseases (plexus tumors) show secretion rates of 60–140 ml/h (Benninger et al. 1992). An important problem is the fast change of volume of the three intracranial compartments, CSF, brain, and blood. The most dynamic part is the blood (approximately 5%), which can significantly increase or decrease in a few minutes – dependent of vascular tonus. Those volume changes can reach the CSF production volume of 1–3 h.
Therefore, the nature has an elastic volume buffer. First, the spinal compartment is surrounded by an extensible dura, fat, and voluminous venous plexus, which can be filled in minutes. The second control mechanism is an immense absorption reserve which is able to drain 100–200 ml/h in case of elevated ICP. In horizontal body position, the jugular veins are wide open and have a very low resistance. 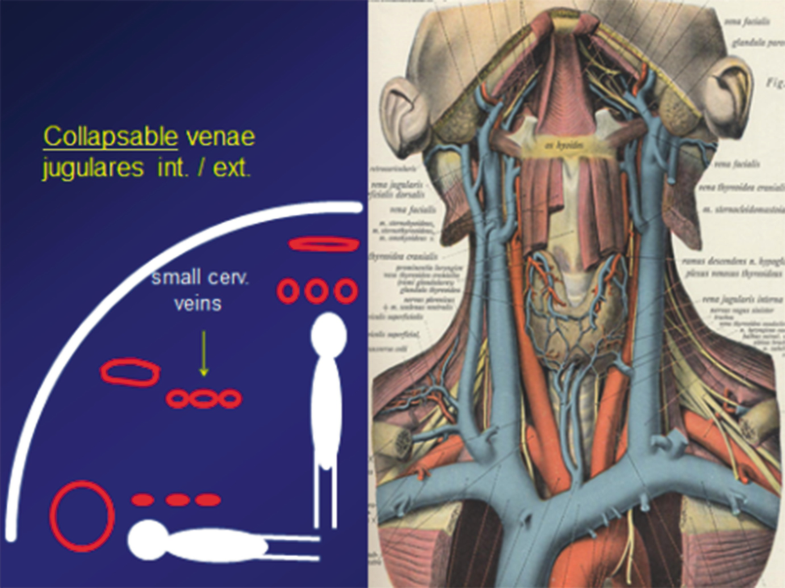 During verticalization, these veins collapse progressively, and most blood must pass the small cervical veins with a high resistance. In upright position, the jugular veins are completely closed. The jugular veins work like an oversized bilateral antisiphon device (Fig. 8). 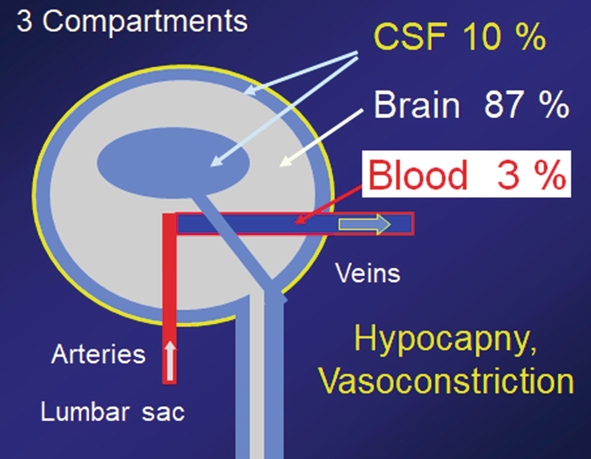 Consequence: The intracranial venous pressure and ICP sink to a moderate negative value – approximately −5 cm H2O only – in spite of a hydrostatic difference of >30 cm H2O. The final effect is that the cerebral perfusion pressure (CPP) is stable in all body positions (ca. 60–70 mmHg). Kadowaki implanted flowmeters (Kadowaki et al. 1995) and registered the shunt flow over 24 h. During the day, the shunt flow was surprisingly low, typically 3–10 ml/h only, but in the night, all patients showed 1–3 high-flow periods with typically 40–80 ml/h, sometimes 113 ml/h (Fig. 9). Most patients seem to be only partially shunt dependent. 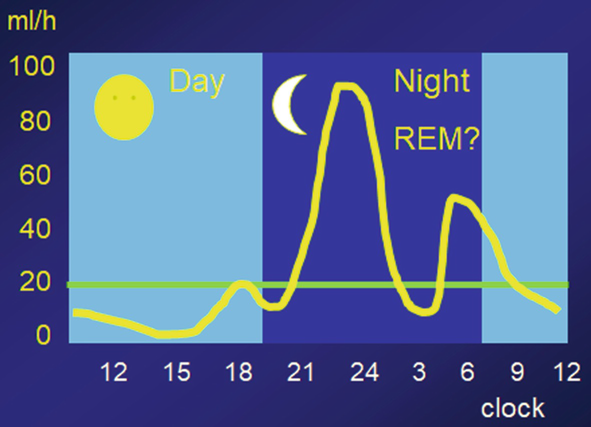 During REM phases a flow reserve – comparable to the physiological peak flow – is necessary. Most of the EVDs in ICUs confirm that 5–10 ml/h (ergo 30–50% of the CSF production only) are sufficient to keep the ICP within physiological ranges. The quote of shunt dependency may range from 1% to 100%. Summarizing the physiological data, the flowrate of valves is normally about 10–20 ml/h, but it also needs a reserve capacity of up to 100 (exceptionally 200) ml/h. Neither the widely varying CSF production nor the vascular activities nor the different grades of residual absorption capacities allow the definition of an “ideal” shunt flow rate – this would be an unphysiologic fiction. The ICP should be kept in physiological ranges, unaffected by changes of body positions, crying of babies, lying on valves, or other external disturbing factors (horizontal +10 ± 5 cm H2O, vertical −5 ± cm H2O). Reflux should be avoided, especially in venous shunting. A shunt should have the durability for at least 20 years. Valves are inflected on the curved head permanently, and many have instable bodies, which can be deformed by external mechanical forces. Simulating a neonatal radius of 4 cm, we observed changes of the hydraulic properties in 56% of probes up to 500%. Additionally the rotation around the longitudinal axis of the valves plays a role. Heyer-Schulte neonatal valve varied from 123 mm H2O (rotation 0°) to 586 (90°), to 150 (180°), and to 449 mm H2O (270°) depending on the direction of flexion (Aschoff 1995). In scars, edemas, and during lying, we have measured subcutaneous pressures up to 30 mmHg instead of normally 3–5 mmHg. Whenever patients sleep on the valves or use a helmet, there are vectorial forces on shunts. With subjects, who rested with their head on the valves, we found in 50% of the probes an increase of resistance, sometimes >1000%; this leads to a functional shunt occlusion (Aschoff 1995). Oversized and especially edged valve bodies and shunt components create problems for the skin. In adults with a good skin, a height of valve bodies of 6 mm seems to be acceptable, but in babies with poor skin, a height of 5 mm should be the maximum; 6 or specially 7 mm is oversized. A half-dome body is optimal and a cylindric is usually acceptable; edged valve bodies should be avoided. The handling requires primarily a fast and simple implantation. Theoretically, a single-piece shunt is optimal. However, this produces problems with ventricular puncture: Often there is debris in the first CSF drip, which may occlude the valves. In addition, necessary external guides are more traumatic. Therefore, the best compromise may be a two-piece shunt with attached distal catheters. 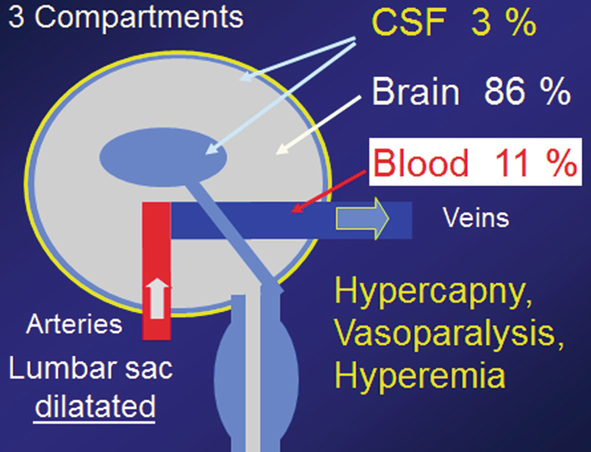 Shunts need a simple and fast access to ventricular CSF for diagnostics such as microbiological analyses and cultures, cell count, chemical analyses, protein, Alzheimer and tumor markers, ICP measurements, infusion tests of iNPH, and intrathecal contrast media and for therapy, e.g., emergent CSF puncture, drainage, or intrathecal antibiotica or cytostatica (Abbott and Sandler 2016). The puncture reservoirs must be easy to palpate; should be available in two sizes for babies and adults; should allow palpatoric differentiation to burr-hole valves; must be visible in x-rays, CT, and MRI; and should produce minimal artifacts and no warming in 3 T MRI. The floor should not be perforated by needles, the body should avoid para-reservoir aspirations, and the diaphragm should accept more than 50 punctures with a G-25 needle without leakage. The way to ventricles should have no interposed valves for drug or contrast application. Simple distal slit valves often miss reservoirs, which is a risk for wandering: Reservoirs work as anchor. Most surgeons wish checks of the proximal catheter patency using manual compression of prechamber (pumping) and observation of refilling. Preconditions: Two unidirectional valves and interposed pumping chamber are necessary. One can be a slit at the end of the distal catheter. Tandem reservoirs, occluded alternatively by two fingers, or single reservoirs combined with the main valve are as well possible. An exhaustive analysis of all available product information (1973–2017), more than 3500 reviewed shunt papers and many personal information revealed at least 292 different valve constructions (including historical models, prototypes, patents, and concept studies) with >550 pressure ranges and >2200 different prefixed assemblies. Since 1987, 90 different valve constructions had been tested in our laboratory (941 specimens). Our tests showed how shunts function by criteria which are described above. Furthermore, tests should simulate the changing between horizontal and vertical positions and show the dependency of shunt functions from body positions. Principally, the changing of position is possible by hanging water column (antisiphon), by built-in weights (gravitational = g-valves), by buoyancies, or by electronic devices. Valves Controlled by Differential Pressure Alone (Not Influenced by Body Position). Long-term studies showed that distal slit valve, proximal slit valves, diaphragm, ball-in-cone valves, and adjustable valves could not achieve the expected goals. In the long run, they worked all in the same way, e.g., do not react on changing body positions. In 1955 Pudenz and Heyer invented the transversal distal slit valve made by Teflon. They published their results in 1957. One year later Ames changed to longitudinal silicone slits (Ames 1967). (For a list of distal slit valves, see Box 1). Ramondi popularized it (1977). The valve consisted of a closed end tube and two to four lateral slits of 3.5–4 mm. It usually had three pressure ranges (L-M-H) and lengths ranged between 50 and 102 cm ± reservoirs. Partially, 24 variants per valve exist! 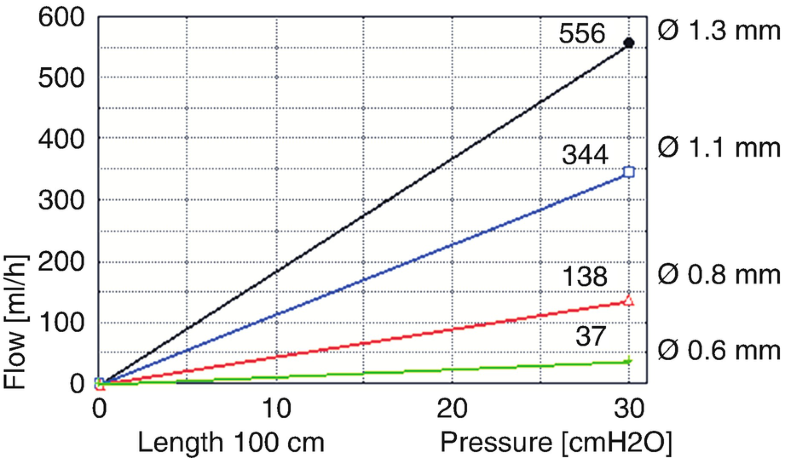 The flowrates vary from 106 to 3265 ml/h (valves without catheters at 30 cm H2O pressure). Nearly all overdrain. The specified data of producers often are not met (Aschoff 1995). Long-term drifts are common; many show reflux. In cheap products (sometimes hospital made), radiopaque markers are missing. The numerous versions without reservoir allow neither palpatoric control nor punctures and show a trend to wandering (no anchor). Note: Wire-augmented Unishunt catheters are at risk for viscus and skin perforations. In 1956 John D. Holter invented the proximal slit valves. They normally have two slit (miter) valves in a retroauricular valve body (see Figs. 10a, b), which allows palpatoric checks (“pumping”) and punctures (For a list of proximal slit valves, see the Box 1). 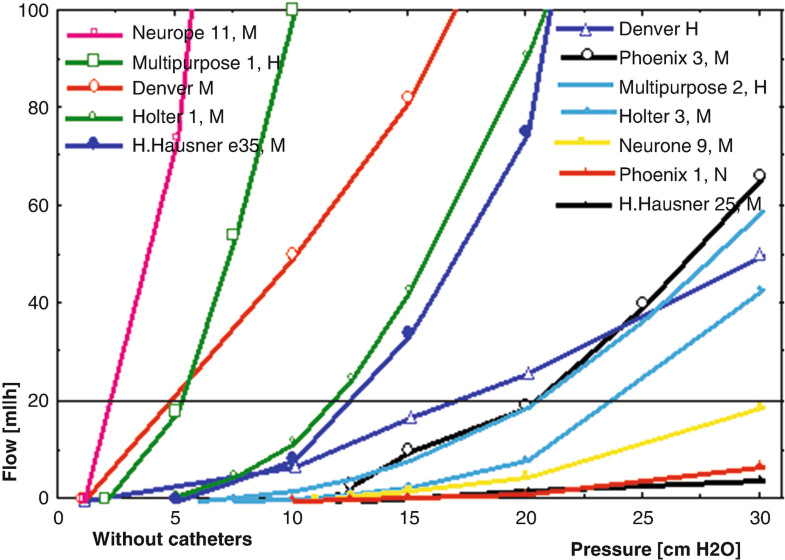 The flowrates vary widely from 0 to 709 ml/h (without catheters with 30 cm H2O pressure). The robustness of Holter valves is excellent, which sometimes work for 20–40 years. The accuracy is often problematic; specifications are inappropriate. Preferably overdrainage but sometimes underdrainage (see Fig. 11). Some proximal slit valves showed major problems: Only one of ten French-Neurone valves worked correctly. In SinuShunt during pumping, a capillary dislocates into the miter valve leading to reflux and shunt insufficiency. The Codman Low-Profile Denver Shunt and Heyer-Schulte Neonatal have instable soft bodies and change their properties in case of deformations (even due to flection on round head). In 1988–1989, Holter-Hausner valves used an incorrect silicone with sticking surfaces and required a major recall. R. Schulte and R. Pudenz invented the diaphragm valves in 1960 (For a list of diaphragm valves, see the Box 1). About 50% of bodies show a burr-hole design (∅ 12, 14, or 16 mm) with one valve unit; the second unit is a distal slit catheter. This combination allows pumping. Alternatively, they have a half-dome contour body, in part with inbuilt second valve units. Punctures are possible but at risk for membrane perforation. Only a few have a needle guard. The valves are relatively robust. Some work for 34 years (see Fig. 10b). The reflux resistance is good. The accuracy is better than in slit valves. The flowrates vary between 261 and 2660 ml/h (without catheter, 30 cm H2O pressure), ergo clinical overdrainage. The curves are preferably steep. Superficial punctures of burr-hole valves are possible, but an ICP measurement may be incorrect due to the interposed diaphragm. Because of missing needle guards, there are risks for membrane perforation. Palpatoric differentiation between burr-hole valves, reservoirs, round Orbis-Sigma valves, and telemetric sensors is impossible. Even x-ray identification is difficult. The ball-in-cone valves were developed by Nulsen and Spitz in l949 (published 1952). Most include two valve units with spring-activated balls in cones in metal cylinders and an interposed pumping chamber, which allowed palpatoric checks and punctures. The classical Cordis-Hakim was patented in 1962. Newer variants often have one valve unit only and a plastic body. They were produced in up to six pressure ranges, with and without reservoirs, and with multiple catheter variants (For a list of ball-in-cone valves, see the Box 1). Ball valves show generally a superior accuracy compared to silicone valves and less long-term drifts. Most have no problems in case of flection, deformation, and external pressure. Reflux problems are rare. Protein susceptibility is low. The flowrates (without catheters, 30 cm pressure) reach from 694 to 1650 ml/h, and the pressure-flow curves are steep, ergo high risk for overdrainage. (DP technology alone without antisiphon or gravitational supplements). In the early 1950s in Boston, V. Bush and D. Matson designed a magnetic hold golden-plated ball valve, which could be magnetized with a large permanent magnet in the OR for an opening/closing pressure on demand (For a list of adjustable valves, see the Box 1). Up to 1957, 18 valves have been implanted in the Harvard Children’s Hospital; adjustments in vivo are not known (personal communication, R.M. Scott 1998). In 1969, Kuffer and Strub built and implanted a cone-in-cone valve with open adjustment by a screwdriver (1971). In 1973, S. Hakim improved the concept proposing a percutaneous adjustment by a rotating magnet. Alternatively, palpatoric manual adjustments were developed. The on-off plug valve of Portnoy et al. (1973) is still on market (Hertle et al. 2010); the Hoover two-way valve (1976) and the MDM-Hashimoto valve with three pressure steps and occlusion were not produced (1991). In 1984, the Sophysa SU3 with three steps and magnetic adjustment and in 1989 the Medos Hakim with 18 ranges and an electric stepper motor for adjustment were launched as first variants of two large and more and more popular valve families. The devices were primarily used alone without antisiphon or gravitational devices. General Problems of Adjustable Valves. AVs were clinically used since 1984. In contrast, the number of studies is minimal: The most successful search word in PubMed is “programmable hydrocephalus valve,” which leads to 192 articles, the term “adjustable” to 105 only, Sophy 21, Sophysa Polaris 9, Codman 67, Medos 23, Strata 17, ProGAV 14, ProSA 4, Certas 4, and Certas plus 1. Unfortunately, most studies contain a limited number of patients with often diverse valves and a short observation period. The few randomized prospective papers have bias or other problems (Lemcke 2013). Reliable studies need at least 100 patients per subgroup, homogenous samples and valves; a follow-up of at least 5, better 10, years; a prospective randomized design; serial ICP measurements in horizontal and upright position (ideal telemetric studies); and a careful documentation of all adjustments and additional valves. A common problem of all adjustable magnetic valves is the low tolerance to deviations between valves and magnet/compass. The threshold for correct procedures seems to be 3 mm in lateral or longitudinal direction, respectively, and 30° rotation around the longitudinal axis (see Fig. 12). In 2017, we observe 12 different adjustment systems and 41 different tools (magnets, compasses, localizator rings, stepper motors, etc.). No hospital offers tools for all AVs; normally they have adjustment options for two to three systems. Valves survive sometimes more than 34 years. The knowledge of neurosurgeons in the year 2050 to handle with older shunts may be unpredictable. Clinically, the AV problems with overdrainage persisted, especially in low and medium ranges. In comparable adjustments, they show the same excessive flowrates as fixed-pressure ball valves: simulating upright body conditions (30 cm H2O), Sophy SU8 drained 1665–2447 ml/h in low position (50 mm H2O, without catheter), in high adjustment (170 mm H2O) 291–605 ml/h. The Medos flow in low position (30 mm H2O) counted 1478–1636 ml/h and in high position (200 mm H2O) 655–972 ml/h. That means, users can select different grades of overdrainage only, but not avoid it. Physiological ICP in upright position would require pressures of 250–400 mm H2O. In horizontal position valve pressures over 150 mm H2O lead mostly to underdrainage, and >250 mm H2O are even dangerous (see Fig. 13). Since 1987, many papers documented regressions of chronic subdurals using high adjustments of AVs. However, these high pressures produce often new symptoms of hydrocephalus such as poor walking, headaches, increased ventricles, or elevated ICP. After reduction of the high pressures, many hygromas come back. High adjustments are not a real therapy but the treatment of the self-produced overdrainage only. The dilemma of DP-valves remains unsolved. In addition, disturbances due to “spontaneous” disadjustments, usually caused by electromagnetic fields or MRI, the sophisticated and fragile adjustment mechanisms – and in Medos the necessary x-ray controls – produced new problems. In 1995, “brakes” of the rotors and free rotation only after solvement were proposed (Aschoff 1995). In 2001, the Sophysa Polaris and in 2003 the Miethke ProGaV were the first AVs with such “brakes,” which solved largely the problems of electromagnetic and MRI-associated disturbances. Strata, Certas and the Sphera Pro followed. In summary, the clinical AV results were not better than those of conventional simple DP-valves, sometimes even more problematically (Richards et al. 2007; Mangano et al. 2005). Theoretically, combinations with antisiphon (1990), gravitational valves (1993), or SiphonGuard valves (2000) could improve the overdrainage problems, not the others. Additional antisiphons showed better results in the first time only; in the long term, the advantages were counterbalanced by the inherent risks of the ASD concept (see part 8). More successful is the combination with gravitational valves (see part g-valves). Systematic studies with the flow-reducing SiphonGuard are not published. In the last years, new prefixed combinations of adjustable with SCD (Medtronic Strata, 1997), and SiphonGuard (Codman Certas 2011) enriched the options. Twenty adjustable valves were actually produced; 18 are historical or only patents. Adjustable valves and their combinations are in industrial countries which are the main focus of discussion and relatively widespread (ca. 50%) and will play a significant role in the next years. Therefore, AVs should be described and discussed in detail. In a polycarbonate body, a semicircular 180° spring fixed on a rotor has a free movement sector of 70°. The spring compresses a ball-in-cone valve in the inlet analogue to a clock (12 o’clock, 0°). In low adjustment (on a clock 9 minutes, 52°) resistance results dependent on the valve version of 10 mm H2O or 30 (most common) and 50 or 80 mm H2O with flow 10 ml/h. In medium position (90°, 15 min), it produces 110 mm H2O (flow 10 ml/h) resistance. 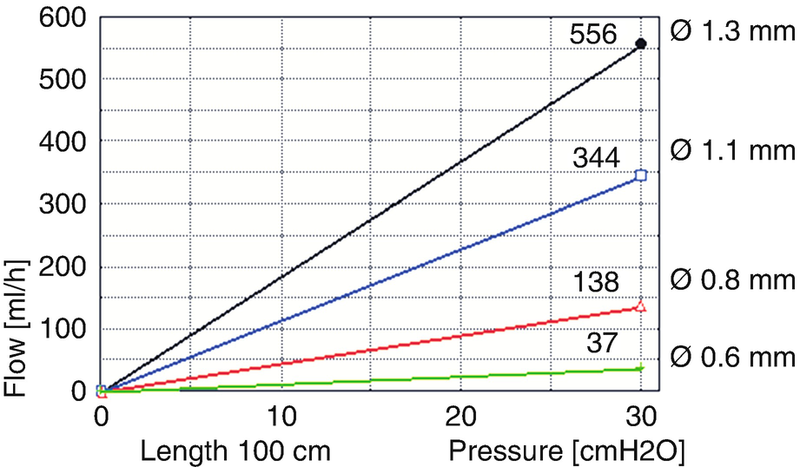 In high pressure (122°, 19 min), the resistance vary from 140, 160, 170, 200 (most common), 300, and 400 mm H2O dependent on valve type (flow is always 10 ml/h, valves without catheter). In the absence of specific tools, an adjustment is possible with all stronger magnets, reading with all compasses with a transparent flor. Mini-Sophysas are flat (4.6 mm) and compatible with babies. Polaris: Functioning magnetic brake, safe in 3 T MRI (Vlach and Négre 2001). The brake can be opened with two antagonist magnets; afterward rotation is possible (Dette et al. 2008). Early Sophy versions before 1992 showed an unprecise axis with free movement, which led to frictions between spring and body or asymmetrical positions of the ball. Often they deviated from the specifications or showed springing values. Later on the axis was improved. They are very susceptible to multiple magnetic influences (15% failure). Early mini-valves showed a high risk for breakage of the distal connector. Three-step valves have great pressure intervals (60 mm H2O). A fine-tuning was not possible. Eight-step-Sophy (SU8/Mini8) sufficient intervals of 15–20 mm H2O. But the intermediate steps have a difference of 10° only and are very difficult to adjust. The marker dots for four versions (10–140, 30–200, 50–300, 60–400 mm H2O) are too small, confusing, and unknown for most users. Polaris: In 2001, the Polaris received a ruby axis. Frictions of brake magnets in the course of time (Vlach and Négre 2001). Randomized controlled studies are missing. Summary of Sophysa: The types without brake are outdated. Polaris combined with a g-valve (Sophy Siphon-x or others) may be sufficient if the high pressure intervals are accepted. In 1984 Medos was patented by S. Hakim. Richard tested it in l989 (Richard et al. 1989) and Aschoff in 1990 (Aschoff et al. 1990) In 2000 the author introduced the valve in the clinic. Codman bought it in l993. The transparent silicone valve body contains two valve units and an interposed pumping chamber. The proximal valve includes a ball-in-cone (ruby), a lyra-formed spring on a titanium base, and a rotor with ten micromagnets in the base and a spiral staircase on top (see Fig. 10b). An external electric stepper motor rotates stepwise from the start position counterclockwise downward to 30 mm H2O (e.g., from 100 to 30 in eight steps), than stepwise and clockwise to the desired new position (e.g., upward to 120 mm H2O). The Medos offers 18 steps in 10 mm increments between 30 and 200 mm H2O resistance (see Fig. 14). Distal of the pumping chamber follows an outlet valve (10 mm H2O, ball-in-cone + spiral spring). Variants with one valve unit only: MicroValve/Codman Hakim™ Programmable Burrhole/Programmable straight. Extremely exact from 30 to 200 mm H2O in 10 mm increments. The 18 steps are ideal for fine-tuning. We found many patients with clinical changes in spite of 10–20 mm H2O variation only. The specified data are met with a high accuracy of ±10 mm H2O. The adjustment using the old external electric stepper motor is comfortable but needs x-ray control. X-ray controls are necessary after MRI or adjustments (Zemack and Romner 2001). In non-orthograde projections or rotations over 30°, the reading may be difficult. A tiny x-ray focused on valve and rotor (ca. 4 × 5 cm) is sufficient and reduces irradiation. X-ray of complete skull should be avoided. Since 2004, a “listening programmer” with a microphone is available, which counts the adjustment clicks. The apparatus goes primary downward to 30 mm H2O and secondary step by step upward to the desired position. Precondition for success is a local razor to avoid disturbing hairs, air bubble-free ultrasound gel, and no movement. Face-down-implanted Medos valves can be used with a special subprogram. Unfortunately, the listening programmer requires typically two to three trials of 10–15 min, due to a repeated cooling of the warmed programming head, sometimes ten trials. Five to ten percent of procedures remain frustran and still need x-rays (Schiebel et al. 2008). 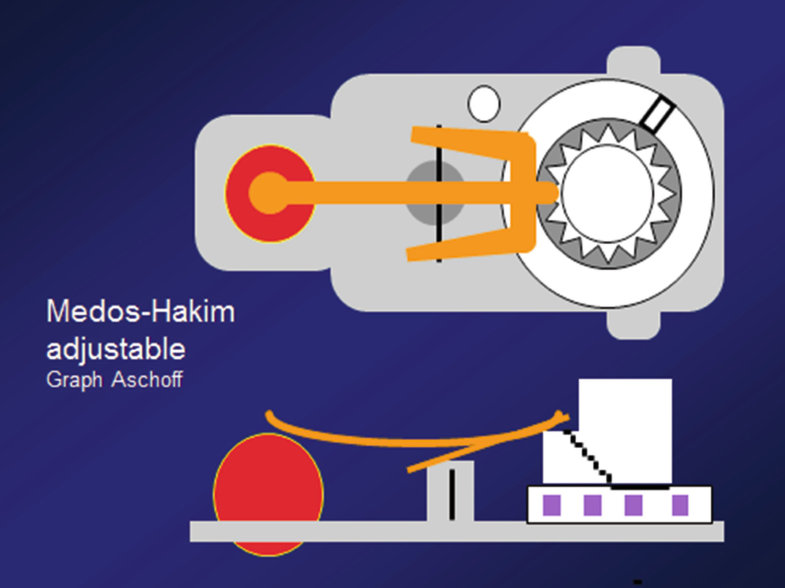 Adjustment without special programmer: The rotor can be rotated with every strong magnet (Medtronic, Miethke), which must be centered exactly over the rotor. A counterclockwise rotation of 360° lead to two to three steps downward, a clockwise to upward. The direct switch from 200 to 30 mm H2O is possible, but not the high step from 30 to 200. Of course x-ray controls are necessary. After some years, ca. 2% of rotors show breakage (see Fig. 15); most of rotors dislocate in the pumping chamber. The same is true for the outlet valve. The cause for such destructions was often pumping maneuvers. Sometimes there are subluxations of the rotor with minimal deviations from the original position. With the listening programmer, a change is impossible (acoustical failure signal). With a hand magnet, a little rotation may be possible, but not real adjustments! which is mostly concentrated around the rotor and seldom in the ball-in-cone mechanism. In 3-T MRI used, ergo protein exposed, Medos are at risk of irreversible loss or reduced skill of adjustment probably or invisible protein (Akbar et al. 2012). Studies with new valves in distilled water without protein have a doubtful reliability. Summary: The Medos was a landmark design and is still a model of precision and subtle fine-tuning options. These properties are counterbalanced by necessary x-ray controls or a listening programmer which is not very reliable. A brake is missing; a high susceptibility to debris and rotor/valve breakages exists. The PS Medical/Medtronic Delta valve was a fixed combination of a diaphragm valve and a SCD antisiphon. In many patients, the valves must be changed due to under- or overdrainage. An adjustable design was necessary. In 1997, the Strata was launched with a ball valve in a regular and a small body: The five pressure ranges show with 5 ml/h flow in horizontal – without hydrostatic suction – a resistance of 15–135 mm H2O, with 50 ml/h 25–155 mm H2O ± 25 mm H2O (Medtronic). In vertical – with 50 cm hydrostatic suction – the resistance should vary between 30 and 147 mm H2O ± 25 mm H2O (with flow 5 m/h) and from 50 to 167 mm H2O ± 40 mm H2O (with 50 ml/h). 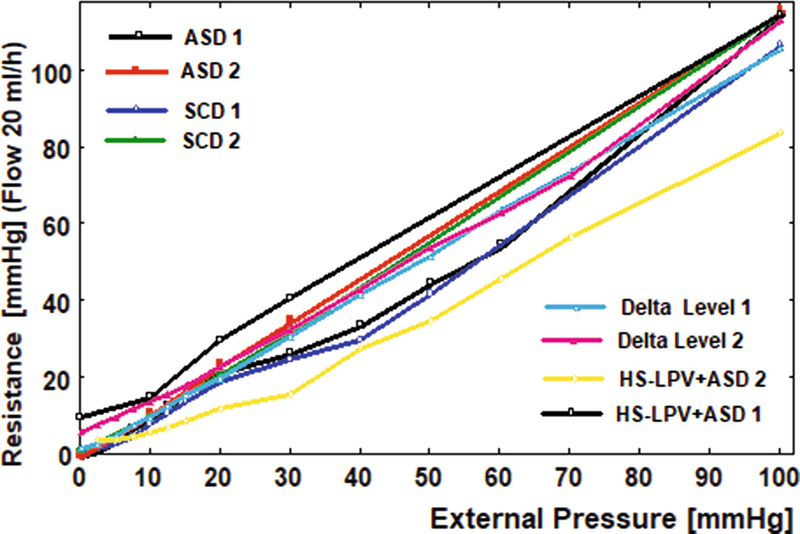 In addition, a Strata NSC without a SCD was produced, with higher pressure-flow graphs >200 mm H2O. Some years later Strata II (regular + small) and StrataMR (2016) followed. Stratas are usually sold in fixed combinations with a SCD, an antisiphon device, which dominates the hydraulic properties (see chapter antisiphon, Part 8). Compared to the Medos Hakim with a high precision of ±10 mm H2O are the tolerances of ±25 up to ±40 mm H2O higher by far. The intervals between the “performance levels” vary between 20 and 35 mm H2O. Therefore, a fine-tuning is limited. The term “performance level 0.5–2.5” is confusing and inhibits the comparison with other valves. A weak point is spontaneous disadjustment. Kestle reported 7% disadjustments (2005). Multiple Strata publications are dedicated to the susceptibility to magnetic tools, iPads, etc. In March 2017 the Strata-MR-valves were recalled due to disadjustments and high resistance under certain circumstances. The other Strata’s received new instructions. Five ranges only, great pressure intervals, and poor fine-tuning options. The ProGAV is the only stepless AV and was patented in 2004. Sprung and Aschoff made the first implantations in the same year. 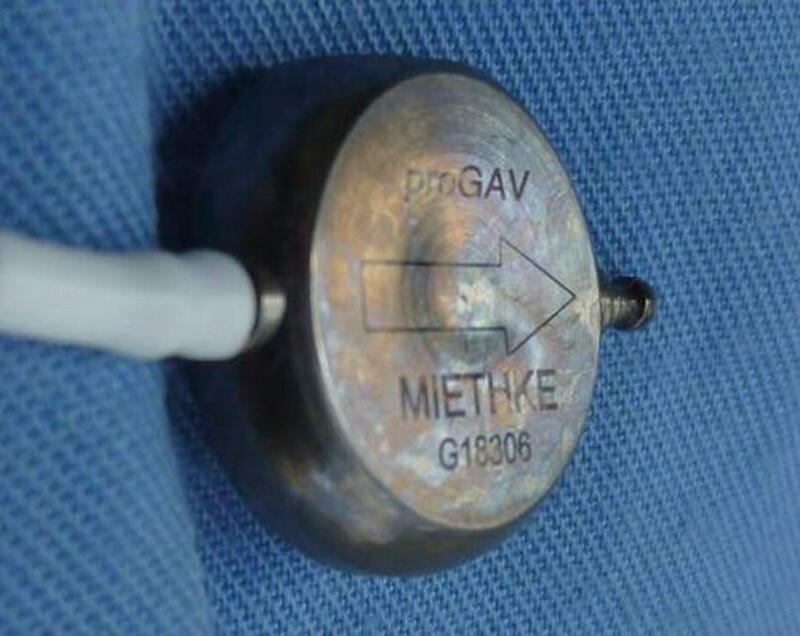 Usually, the ProGAV is combined with separate gravitational valves (Miethke ShuntAssistant, ProSA), but 10% of users implant the ProGAV without g-valves, which lead to terminological confusions. The rotor has a friction brake, which can be solved by the pressure of a small cylinder integrated in the adjustment tool. The ProGAV can be adjusted continuously between 0 and 200 mm H2O and is ideal for fine-tuning. The position 0 (open) is useful for shunt function diagnostics. 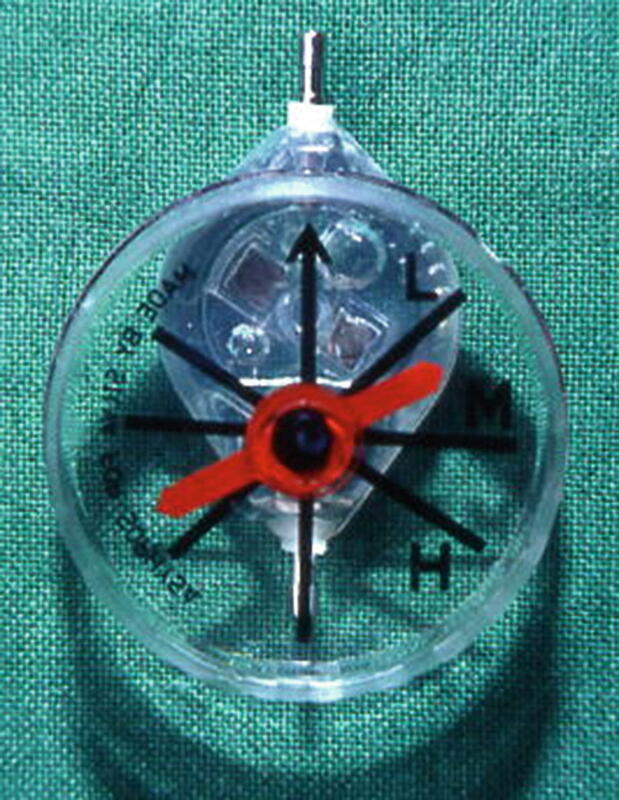 Without special tools, every compass with a transparent flor allows position reading. Without specific tools, adjustment is possible using a 4 mm Ø burl sealed on an acryl plate centered on the ProGAV. Use moderate pressure and rotate a strong magnet. The ProGAV has one valve unit only. Punctures require prechambers, palpatoric checks on additional valve (Sprung-Reservoir), or reservoir compressions. The release of brake is unpleasant for the patients, sometimes even a little bit painful. In children and sensitive patients, anesthetic gel (lidocaine) should be applied 20 min before. Since 2015, a ProGAV 2.0 with a new brake mechanism is available, which has an on-off switch for manual opening respectively closing the brake. It allows a painless adjustment and protection against the denting of the valve body. In addition, internal empty spaces with low flow were reduced to protect clotting. The Certas was a quite new adjustable design with magnet and compass similar with other products; the sophisticated electric programmer is no more necessary. Certas offers seven pressure ranges. An additional very high pressure range of 400 mm H2O serves for testing of shunt dependency and application of cytostatica. In test literature, Certas is resistant to 3-T MRI. In emergencies an adjustment is possible without official tools with strong magnets, e.g., the Miethke ProSA magnet: Primarily, the rotor must be elevated over the axis, and then a rotation down- or upward is possible. The tolerances of ±20 up to ±50 mm H2O in setting 1–7 are a regress compared to the precise Medos Hakim (tolerance ±10 mm H2O). For setting 8 (“virtual off,” 400 mm H2O), the measured opening pressures ranged from 451 to 556 mm H2O, ergo deviations ranged from 49 to 156 mm H2O (Arnell et al. 2009). Four of seven steps are within very high pressure (178, 206, 238 mm H2O); these steps are seldom used. The increments in the low/medium region are too high (37 mm). During puncture of prechamber, the needle tip can reach the ball valve. Certas was recalled in 2013. In 2015, Certas was relaunched as Certas Plus. There are a few improvements using titanium instead of plastic components. The flow-pressure graphs of same settings are significantly lower up to 36 mm H2O compared to Certas. Certas Plus valves were often combined with SiphonGuard (see Part 10). In the great NPH-study of Sundström (2017) Certas-valves showed 16.7% chronic subdurals (Medos 9.2%, Strata 10.3%). In 1973, Portnoy and Schulte were the first to simulate the natural regulation of collapsable jugular veins in the shunt technology. They patented the Heyer-Schulte Antisiphon Device (ASD), which consisted of a flat cylinder with a collapsable diaphragm on the top; the square of this diaphragm is nine times larger compared to an internal passageway, which is touched by the diaphragm. 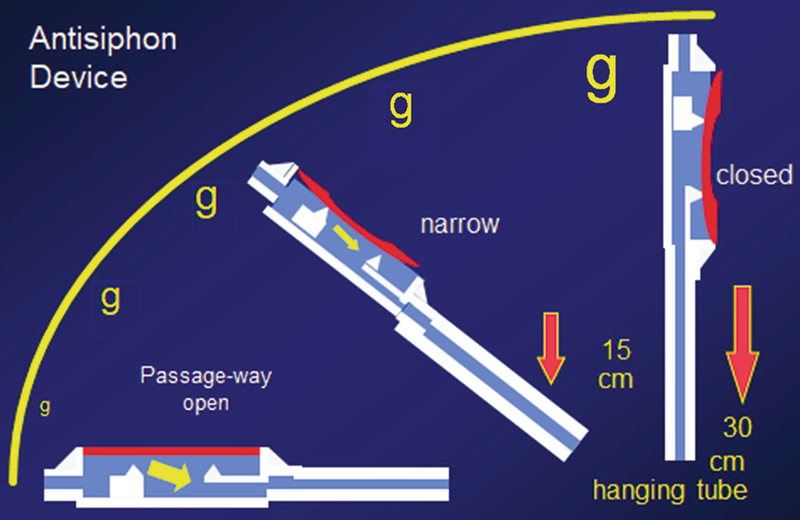 In horizontal position, there is a negative pressure in the hanging catheter, and the passageway is minimally open. During body elevation the suction of hanging water column increases and leads to a high resistance and theoretically to a compensation of the hydrostatic overdrainage (see Fig. 17; Gruber et al. 1984; Kremer et al. 1994). The implantation site determines the length of the hanging tube. All antisiphons are calculated for implantation in the level of skull base. On the calvary, the hanging water column is 8 cm longer with risk of overshooting effects and underdrainage; a deep implantation on the neck shortens the water column and leads to overdrainage. Thoracic or abdominal placements make no sense. The Radionics Siphon-Limiting Device™ (SLD) and a Brazilian antisiphon (“Sphera”, Hpbio) are similar to the ASD. In contrast, the Siphon-Control Device (SCD) of PS Medical/Medtronic has a second diaphragm on the bottom (ratio: membranes’ passageway, 1:18). Except for the mentioned four basic designs, there are 44 numerous fixed combinations with diaphragm DP-valves, slit (1), ball (2), and adjustable ball valves (Medtronic Strata regular + small, Medtronic Strata II, and Medtronic StrataMR are actually recalled). The antisiphons are compact and relatively cheap devices, available as separate devices or integrated in numerous valves. In vitro they reduce in vertical the flow effectively mainly depending on the length of hanging tube. In growing children, the effective length is automatically adapted; the same is true for variable abdominal pressures. The large diaphragm is part of the valve body and completely exposed to any local hydraulic or vectorial pressures (Kremer et al. 1994). Whenever the patient is sleeping on the antisiphon, the shunt is functionally occluded (Horton and Pollay 1990; Mc Cullough 1986). An occipital placement causes the highest risks, but also on temporoparietal sites, ASDs can be blocked. The calvary is relatively safe. Unfortunately, a high placement may increase the hanging tube and produce overshooting effects, ergo underdrainage (see Figs.18 and 19). Nearly all shunts induce local scars. If a high viscosity develops, scars decrease the mobility of the diaphragm leading to under- or overdrainage (Drake et al. 1993). The bottom membrane of the Medtronic SCD is in touch with the bone and probably inhibited in movement. Up to now no lab had tested this condition! Forty-four years after clinical introduction, the ASD literature is limited (59 references in PubMed). 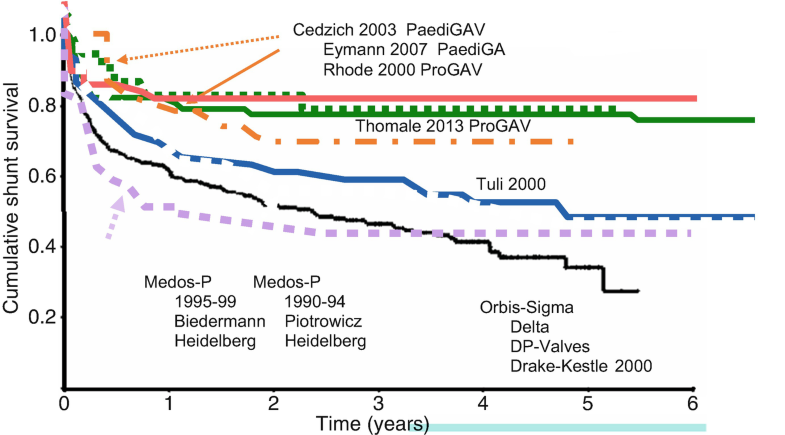 We found one long-term-report only (Gruber and Roehrig 2010). The rare comparative studies registrated a standard survival (Drake 1998), increased problems (Miyake 99) respect. 10.3% chronic subdurals (Sundström 2017). The antisiphon studies show a 40% standard survival but more poor results (Kestle et al. 2000). We studied between 1990 and 2010 38 ASD/SCD patients. Three of them showed good long-term results only; 25 devices had to be removed. Summary of antisiphon valves: The nature uses jugular veins on both sides. Even during sleep on the lateral side of the head, a compression is excluded due to the prominent mastoid/head and shoulder. In contrast antisiphons are placed on the maximum of the lateral or occipital head, ergo on the most dangerous places with significant risks of shunt disorders. Without change to a calvarial placement and the adapted ratio of diaphragm versus passageway, the antisiphons remain in the state of “anti-function devices.” The inventor Portnoy changed them to gravitational valves (Portnoy 1989 Pat US 4,867,741. 2003, personal communication). (Ball valves, in vertical position high resistive by the weight of inbuilt spheres). In 1975, S. Hakim patented a combination of a classical DP-ball valve with a gravitational (g-) valve, which contained in a second cylinder three or four weight g-balls and a small closing ball in the cone. In horizontal the g-balls roll anywhere in the cylinder, but the cone is open and flow-free. Parallel to the elevation angle, the g-balls press on the closing sphere and increase the resistance continuously. The “horizontal-vertical valve” is designed for lumboperitoneal shunts and has lateral connectors, an inlet for tiny 0.8 mm lumbar catheters, and a standard outlet (1.1 mm). Precondition for correct function is an implantation along the longitudinal axis of the body. (Jackson the leader of a major clinical Hakim-lumbar series implanted the devices. He died by air crash. His excellent results were never published (pers. inform. M. Sussmann, Cordis).) There was no clinical report until 2007 (Wang 2007). There were a few sporadic implantations, but the g-concept was forgotten. A similar “antisiphon ball valve” was implanted by Yamada 1979 in a few patients (still produced by Fuji). In 1984, Sainte-Rose patented two g-valves (“variable impedance valve” 2 + 3; EU0115 973); Holter too patented a combined g- and slit design (US 4,621,654; 1986). Both designs showed problems with uncontrolled lateral deviations of the g-balls. The Sophysa AS with a gravitational anchor worked correctly in one direction only (US 4,673,384; Marion 1987). In 1989, Portnoy patented a gravitational valve with multiple spheres (US 4,867,741). Richard (1989) demonstrated superior properties of the Lumbar valve in vitro. I confirmed his results and proposed “A combination of a smaller catheter-diameter, a ... hydrostatic off-set-valve and the programmable valve technology could reduce the overdrainage-risks to a minimum ...” (Aschoff et al. 1991). In 1991, Affeld patented a multistep g-valve as precursor of the dual switch (DE4130601). Agrawal developed an Indian g-valve (US 5042974; Chhabra et al. 1993). A thoracic implantation (Aschoff et al. 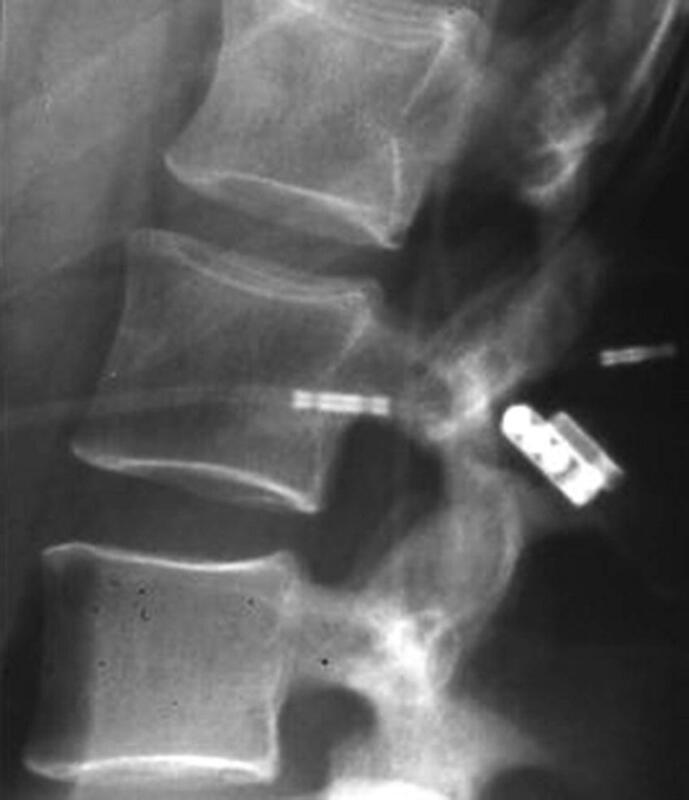 1993) guaranteed a stable vertical position but required a loop of catheter due to the lateral connectors, unsuitable for the mass of VP shunts. I proposed longitudinal g-valve bodies with vertical connections, realized by Cordis with the Gravity Compensating Accessory (GCA) with three pressure steps in 1994 and by Miethke with the ShuntAssistant in 1995 (six ranges, 10–35 cm H2O). In 1994, Miethke presented the dual switch (EP 0614 673), a gravitational switch between two separate cone-in-ball valves (12 pressure combinations; Sprung et al. 1997), later the tiny PaediGAV and the medium-sized GAV, each with combined g- and DP-valves in nine versions (1998) (see Fig. 20). In 1995, the author proposed adjustable g-valves (Aschoff). In 2004, this idea was picked up by Miethke. His ProSA allowed a stepless variation between 0 and 400 mm H2O using the technology and the friction brake of ProGAV. The valve was launched and implanted in 2007 (Aschoff et al. 2009; Kehler et al. 2015); a ProSA 2.0 with the brake of ProGAV 2.0 followed. Interesting patents are g-valves, integrated in a Rickham reservoir (US 7282040 B2, Hokanson,Vygon) or with buoyancy bodies (Magram, US 5634894). The Brasilian Sphera-Pro (2018) combines an adjustable ball-valve with g-valves (6 ranges). More recently, we overview 13 different g-valve designs on market, seven of them serve as g-valves for supplementation of DP-shunts. Six combined g- and DP-valves and offer 46 pressure ranges. In addition, there are eight patents, five prototypes, and nine concept studies. The production of g-valves is relatively simple and cheap except for the adjustable versions. 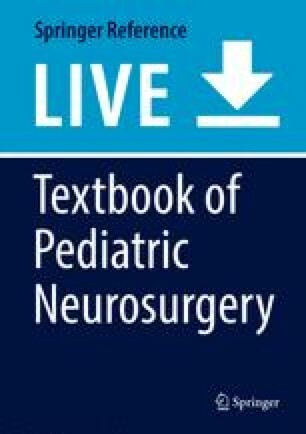 Neurosurgeons have the choice between six combinations of g- and DP-valves in one body (33 pressure ranges) and seven separate g-devices with 16 fixed pressures (100–350 mm H2O) and two variable types (0–400 mm H2O), which supplement DP-valves. Existing VP shunts can be upgraded in local anesthesia over the sternum within 20 min. If the g-valves are vertically implanted and the pressures correctly selected, the quote of normalization of ICP in all body positions is >90%. Overdrainage-related problems improve or disappear (Alavi et al. 2017). Irreversible side effects of chronic overdrainage in the childhood such as dolichocephaly and microcephaly, thickness of skull, or enlarged pneumatized sinus remain unchanged. Slit ventricles persist often, but the slit ventricle symptoms decrease (see Figs. 17, 21, and 22). In most g-valve series, the quote of chronic subdurals is very low (Lemcke et al. 2013; Kiefer et al. 2002). Especially the round Hakim-Lumbar often rotates to diagonal/transversal positions, with dysfunctions. A careful fixation with four sutures on stable facies reduces this risk (Wang et al. 2007). Other g-valves too need stable positions. Thirty percent of g-valves are implanted discrepant to the body axis (Park et al. 2007; Vienenkötter et al. 2008; Freimann et al. 2014). During evaluation, especially in studies, the deviation angle must be carefully documented with reference to the German horizontal (eye-ear plane) or thoracic column. Deviations of over 30° should be corrected; 10–30° failures should be improved in case of clinical problems. The ideal vertical position runs parallel to the sternum. The lateral head is a possible site too, but at risk for discrepant axes between the body and head, which is true, e.g., during reading with 40° head anteversion or sleeping with 30° head elevation in contrast to a horizontal body. Underdrainage of bedridden patients may be often a consequence of head-implanted g-valves; it is avoidable after chance to a thoracic placement (Park et al. 2007; Vienenkötter et al. 2008; Freimann et al. 2014). Due to the growth of children, the thoracic implantations include the risk of tensions of shunts with following disconnections, which lead to the dilemma of either prophylactic shunt renewals in childhood or to a suboptimal retroauricular placement. Vertical movements, e.g., jogging, induce ballistic movements of the body and even of the g-balls and reduce the efficiency. Summary g-valves: We reviewed 442 papers related to g-valves and implanted 1108 g-valves in 822 patients. Currently, gravitational valves may be the best solution to reach a physiological ICP in all body positions. They are to be implanted in the longitudinal body axis (±10°), in adults ideally thoracic, and in children retro auricular. The pressure should be adapted to the body length. Adjustable g-valves (PROSA) are recommended in difficult cases. (Synonyms: Flow-controlled, flow-regulated, flow-regulating, autoregulating, and variable-resistance valves with pressure-dependent negative feedback regulation). A great number of flow-reducing valves were proposed and patented since the 1970s (US 3,601,128; Hakim 1971, Hildebrandt (US 4,156,422; 1979)). A group of Cordis engineers around Hooven (Sierra, Saul, Sussmann, Doumenis) and the neurosurgeon Sainte-Rose developed in the 1980s a three-stage valve, which was published in 1987 (Sainte-Rose et al. 1987). The Orbis-Sigma (OSV) initiated a couple of clinical trials (Decq et al. 1995; Drake et al. 1988; Serlo et al. 1986; Kestle et al. 2000; Hanlo et al. 2003; Beuriat et al. 2017) and in vitro tests (Schoener et al. 1991; Czosnyka et al. 1998, 2002; Aschoff et al. 1993, 1995; Trost et al. 1991). After 8 years an OSV II followed with a reinforced diaphragm and four CSF inlets for a more symmetrical flow. The terminology is confusing “Flow-controlled, flow-regulated valves”: There are no flow sensors and no regulation by flow. Differential pressure is steering the membrane shift in Orbis-Sigma, and differential pressure is creating the flow. This means that the Orbis-Sigma is pressure controlled, similar to all other valves. “Flow controlled” and “flow regulated” are terms of marketing, not of physics and should be avoided. “Variable resistance valves”: Adjustable, antisiphons, and g-valves vary the resistance too. Empty formula! “Flow-regulating shunts”: Every catheter, every valve, and even connectors regulate flow. Empty formula! “Self-adjusting-autoregulating valves”: Mechanism unclear. Simple handling. The valve is usable for all patients except those with hypersecretion, bloody CSF, or high protein content. A typical finding of OSV studies are shifts from over- to underdrainage. In 2003, Hanlo found within 557 mixed patients a relative low quote of overdrainage (2%) but shunt blockade in 13.5% and 5% valve occlusion. Serlo (1995) reported similar data. On the other hand Beuriat reported a high quote (28%) of ventricular catheter obstructions, which is characteristic for overdrainage. The typical flow through Orbis-Sigma is 20 ml/h; this is far more than the CSF production rate of babies and children. Therefore overdrainage is possible. The body position, respectively, the gravity, is the most important factor for a physiological shunt function. The regulation mechanics of OSV is blind and not suitable, to differentiate an ICP crisis from standing up. All producers specify their valves with lines, areas, or numeric pressures. 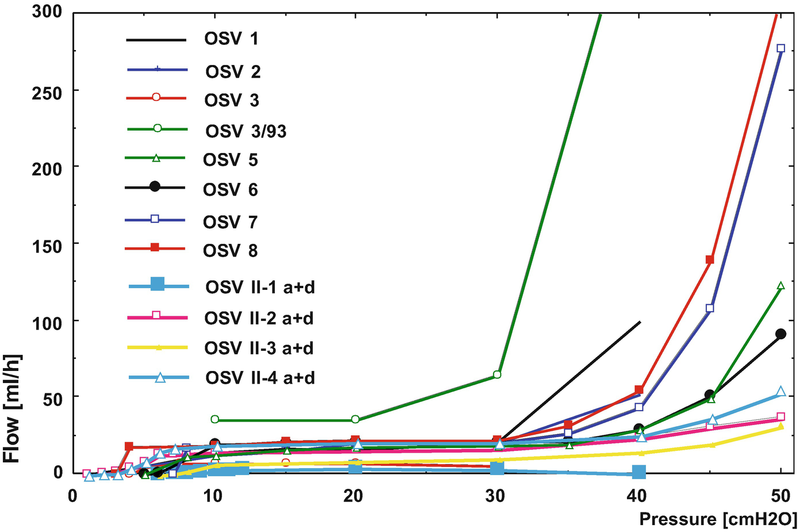 OSV presents multiple curves, which differ in the key region around 20–30 ml/h for 30 mmHg. A comparison with specification is arbitrary. In precursor patents the central pin was a complex body with a ball, cone, and cylinder. During movements of the ruby ring, the risk of frictions may be immense. In lab studies there is mostly a massive hysteresis, which lead to a wide variation of curves. It is reducible by vibrations. The key problem may be frictions of ruby ring on the central cylinder; the distance is 0.08 mm only. It is evident that precipitations in this slit provoke mechanical problems (Schoener et al. 1991) (see Fig. 22). The SiphonGuard was patented by R. Nissels in 2000. It contains a two-way valve, regulated pressure depending of a ball-in-cone valve. In case of high DP, the flow must pass a 40-mm-long spiral channel with a diameter of 0.4 mm, which is produced by two threads (see Figs. 23 and 24). Internal diameter in the screw is 0.4 mm only. High risk for occlusions! Zone of overdrainage with pressure 8–15 cm H2O: Flow peaks up to 160 ml/h (see Fig. 19). During higher pressures, flow restriction is rigid. Safety stage is missing in contrast to Orbis-Sigma. The radiopaque marker is too small. Serial ruptures (n 58) from the Medos valve body (Woerdeman and Cochrane 2014). Minimum of literature (only four in PubMed). In the NPH-study of Sundström (2017) with 19.6% chron subdurals the poorest result. In 1996, N. Paes published a new auto-adjusting flow-regulating device with two slit valves. The combined valves produce a pressure-flow-graph similar to Orbis-Sigma (see Fig 23 - no more fig 24, due to shift of numbers). 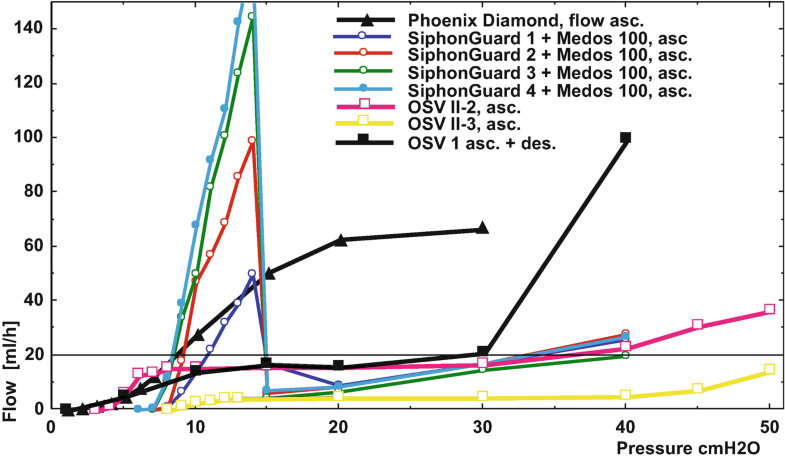 The flow limitation is less rigid as in OSV and SiphonGuard (see Fig. 23). In literature there are a few papers only and no controlled clinical studies. The history of hydrocephalus and its treatment is thematized in multiple papers with extensive literature (Goodrich 2016; Aschoff et al. 1999; 198 references). Since 1962, more than 1652 valves had been tested in vitro by 84 authors, collected in 439 papers. Since 1989, many use the ISO Standard 7197:1989 (Forrest 1962, Rayport 69, Fox 1973; Hakim 1973; Watts and Keith 1983). Centers were the labors in Cambridge (Czosnyka 1997, 1998, 2002), Umea (Ekstedt and Friden 1980; Arnell et al. 2009; Eklund et al. 2004), Aachen (Richard 89, Jetzki 2018; Elixmann et al. 2014), and Heidelberg (Aschoff 1995, 18 coworkers). Actually the biggest part of research in shunts and patents focuses on electronically controlled shunts, which were proposed by Rekate in 1980 (overview Lutz et al. 2013; Elixmann et al. 2014; Jetzki 2018). Most components are available, but safety, reliability, and costs are uncontrolled up to now. The next shunt decade will remain mechanically except for telemetric ICP monitoring (Aschoff et al. 2001). Since 1949, at least 292 different valves had been introduced predominantly by cloning of previous models. About 160 are available on the market. Between 1949 and 1960, simple differential pressure valves (138) were developed in the USA. They represented the technology of the 1950s, in spite of some face-lifting of the more recent clones. The valves of this “first generation” lead inevitably to an unphysiological ICP either in vertical or in horizontal position (“hydraulic mismanagement,” Hakim 1973). The basic designs of the “second generation” were developed between 1951 and 1969 (adjustable valves); 1973 followed the antisiphon, 1975 the gravitational, and 1987 valves with a negative feedback regulation (low flow). They played a significant role not before the 1990s. Even in industrial countries, about 50% of implanted valves are simple differential pressure designs. In the 1950s to 1970s, the USA had quasi a monopoly in shunt research as well as in valve production. In the last decades, shunt innovations spread over the world not only in Europe but also in India, Japan, Brasilia, and even developmental countries. BMI Medical CSF Flow Control Valve, Chhabra “Slit n Spring” Valve Cylindrical + Large Reservoir, Codman Denver Cylindrical, Codman Low Profile, Codman Extra Small, Hpbio Neonatal-Infantil-Adult – MicroValve, Integra Heyer-Schulte UltraVS Standard, valve only, Integra Heyer-Schulte UltraVS Small, Integra Heyer-Schulte neonatal valve only, Integra Heyer-Schulte Mishler Flat-bottom valve, Integra Heyer-Schulte Spetzler Lumbar Peritoneal In-Line, Kaneka Proximal slit valve in a contour body, Vygon Monopressure CRX™ valve only, (formerly: Phoenix CRX valves), Vygon CRX ™ Valve kit, Vygon Universal Monopressure Valve (formerly Phoenix CRX™ World Shunt). Burdenko valve with metallic body (Russia), Dahl-Wade valve 1973, Farr valve historical 1962, Heyer-Schulte Mishler Dual-Chamber Burr Hole, Dual-Chamber Burr Hole 12/16 mm, single + double inlet (ca. 1977), Schubert and Zeiner Dresden Diaphragm Valve 1963–1970, Schubert 1965. BMI Medical CSF Valve Burr hole 12/14 mm, Chhabra GSL Dome valve, Codman Flushing Device, Accu-Flo Burr Hole, Dewimed Flat Bottom Pediatric + Adult ± extra disk check, Dewimed Burr Hole Pediatric + Adult, Integra NeuroCare Heyer-Schulte Pudenz CSF Flushing Valve 12 mm + 16 mm Ø, Heyer-Schulte Profile Valve System (Profile VS) Low-Profile Valve, Heyer-Schulte Mini Low-Profile Valve LPV + LPV Mini Heyer-Schulte Mishler Dual-Chamber Burr Hole new, Integra Radionics Burr Hole Valve, 12 + 16 mm Ø, Integra Radionics Contour-Flex Regular + Small + Neonatal Valve, Kaneka OM Burr Hole Valve 12 + 16 mm Ø, Medtronic CSF Flow Control Valve, Standard, Burr Hole 12 + 16 mm Ø, Medtronic CSF Flow Control V. Contoured Regular + Small + Ultrasmall, Snap Shunt assembly, Mini Shunt assembly, Medtronic CSF Flow Control Valve, Button design, Medtronic CSF Flow Control Valve Cylindrical, MedSil L-M-H (similar Burdenko valve 1984), Sophysa Pulsar 12 + 16 mm, “Shanghai Diaphragm” Valve (Personal comm., M. Choux 1996, Vygon Monopressure Burr Hole Valves Ø 9–12-16 mm. Sikkens-Engelsman ball and distal slit valve 1956, Schubert-Zeiner Dresden ball valve 1965, Bosino valve No. 2 with spring + gas chamber Bosino 1991, Phoenix Acura Elite (polysufone housing and set screw with elgiloy spring and sapphire ball), Elite World Shunt, Elite Prescription™ Valve. BpBio (Brazil) Sphera 3 versions: Adult-Infantil-Neonatal; Codman Hakim™ Precision Valve with two valve units; Codman Precision Valve with one valve unit, burr-hole, straight, and micro-valve; Miethke MonoStep; Miethke MiniNav; Integra Cordis Hakim Valve Standard + Pediatric + Omnishunt + Atlas Valve; Sophysa fixed pressure (50–110–170 mm H2O); Vygon Acura™ single + double valve. Adjustable valve with screwdriver 1–4 Patent 4,551,128 Nov 5, 1985, S. & C. Hakim Percutaneously adjustable valve with rotating magnet Patent 4,551,128 Nov 5, 1985, Codman Hakim™ Programmable with “brake” 2002 US patent 192,394, not realized, Codman Certas* Programmable valve Ø catheter US Patent 08617142–201 828,800 Launch 5/2011, Recall 2013, Sophy SU-3, big body (50–100-160) US Patent 4,443,214; 17.4.1984 SU3 (produced ca. 1984–1989). Medos Hakim Programmable = Codman Hakim™ Programmable with two valve units, pumping options, and separate reservoir; Codman Hakim™ MicroValve Programmable with one valve unit; Codman Hakim™ Programmable Burrhole; Codman Hakim™ Programmable straight; Codman Certas Plus (without SiphonGuard) ± Bactiseal; Medtronic PS Medical NSC Adjustable Valve Regular + Small + LP; Miethke ProGAV 0–200 mm H2O without g-valve (variants with attached ShuntAssistant see under g-valves); Miethke ProGAV 2.0 0–200 mm H2O; Sophysa SU3; medium body (50–110–170 mm H2O) SP3; Sophysa Sophy SU8 (50–170 mm H2O); variants with maximum pressure 200/300 mm H2O, SU8–200, and SU8–300; Sophysa Mini Valve 3 pressures (50–110–170 mm H2O) SM3; Sophysa Mini Valve 8 pressures (30–200 mm H2O) SM8, variants with 10–140, 50–300, and 80–400 mm H2O; Sophysa Polaris; 5 ranges (30–200) + magnetic brake variants with 10–140, 50–300, and 80–400 mm H2O; Integra Heyer-Schulte Multipurpose On-Off Flushing L-M-H NL850–0125, −28, −32 Sphera Pro hpBio.